Buxton Rugby Club’s second string maintained their 100 per cent record in 2017 with a derby win over Chesterfield Panthers. On a perfect day for rugby at Sunnyfields, a number of players stated their case for first team call ups in future in an emphatic victory. Skipper Dave Hodgkinson had recalled some famous Buxton names for the season finale. The Stags second string were looking to finish on a high, but it was the visitors who opened the scoring. A try behind, the Stags called on all their experience. Jackson, Lomas and Whitmore started to boss the set-piece giving Steve Edge and TS Jervis the freedom to roam. Burford was back to his best, crashing into the Panthers defence. Bartrum showed his blistering pace, assisted by the bulk of B. Kirton as they played havoc in midfield. Jackson opened the Stags account, launching himself over from six metres out. The irrepressible Weir slotted the extras. D. Lomas scored next after some great work from W. Batterbee at scrum-half. Jackson scored his second after stealing Panther ball and scurrying over from 20m out. Panthers replied with a good midfield breakaway try but Lofty was next to score for the Stags, sweeping away all before him. G. Ives and A. Holliday were outstanding in defence giving Panthers little time to maintain their rhythm. Preece and Hodgkinson rekindled their old “one-two” moves to the delight of the large crowd. After some ill discipline both teams were down to 14 before the break. A string of superb tactical changes saw the introduction of the Barber boys and Huw in the second half. The fresh legs added the extra impetus. Campbell scored a fabulous solo try having been fed by Edge in their own half. Panthers replied but the Stags were playing some delicious rugby. Jervis was herculean under the high ball and R. McCoy delivered a masterclass in line-out play. 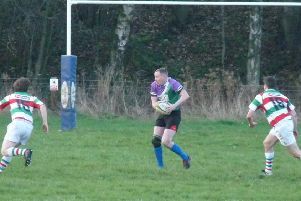 Lofty scored the next try after Bartrum softened up the defence first. The Stags began to suffer injuries and numerous changes had to be made, but T. Barber ran in a 40m try leaving defenders in his wake. The final score was a textbook Buxton try. Set-piece ball saw Buxton gather 30m out, Jervis showed his natural ability to draw the defence before delivering an inch perfect pass into the the grateful arms of Dredge who touched down for the first time in five years. A delighted team manager C. Scrimshaw said: “Panthers were a tough test, but our boys gave them one hell of a beating.